The WordPress.com stats helper monkeys prepared a 2012 annual report for this blog. Pretty interesting read for me. Apparently people from over 53 countries have read this blog… which is simply ridiculous. A little update before the report. It is 2013. I originally began this blog as a New Year’s resolution for 2012 to document my year of not buying things that were made in China. And while I did write a few posts, I largely fell off the blogging bandwagon, even though I went so far as to go to China to do a bit of research. My last post was in late July, which is pretty sad. That said, I want you all to know two things. First, I continued my China boycott right until the end of the year. I didn’t give in. There were one or two Chinese things that I purchased accidentally, but otherwise, I was true to my goal. In fact, I have found living without Chinese goods to be fairly easy if one is careful. I even plan on continuing a boycott of sorts. And second, I have continued writing blog posts. I have a number of half-completed documents strewn about my desktop. My New Year’s resolution for this year is to get these finished and get them out to you, especially the ones about my trip to China. It was marvelous, I learned a lot, and I can’t wait to share it with you. That is all for now. Happy New Year! Enjoy the report below. 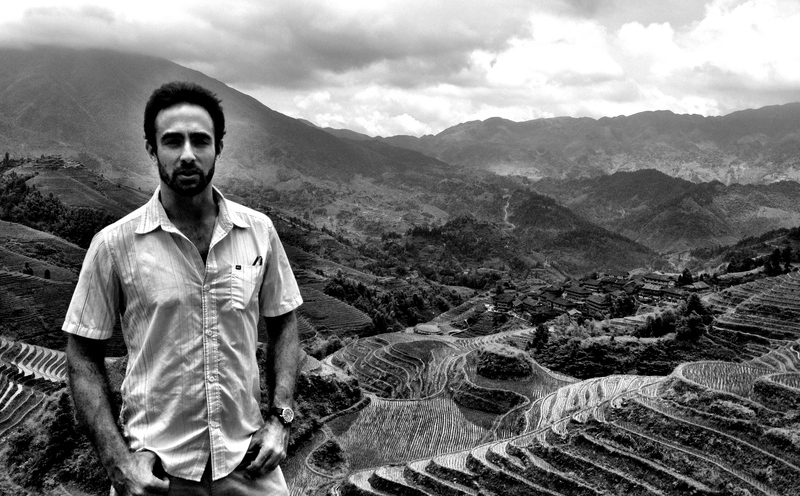 I am back home safe from my trip to China, completely unscathed by Maoism, Red Guards, and dangerous drinking water. I don’t mean to get so personal so quickly, but I kid you not, I was never forced to use Imodium. Not once. How then shall I regale you, dear reader, with pithy, yet poignant stories of my travels to the Orient? Let me break it down for you. I will be writing four posts on my trip to China. This first post is a clear-cut recap of my trip. The second post will be dedicated to a discussion I had with Roger, one of the big wigs at Nike in Hong Kong. Roger provided incredible insight into the world of Nike’s manufacturing and supply chain in China. The third post will detail my trip to a garment factory in Cixi City, north of Shanghai. Here you will encounter my fearless factory fixer Phil, who turned out to be one of my favorite folks. And the fourth will document one of the most beautiful places I have ever laid eyes upon. I am not a travel writer. Actually, I am not a writer, period. But I am certainly not a travel writer. Good travel writing requires measures of vocabulary, wit, and endurance that I simply do not posses. J. Maarten Troost has all three in abundance. A few years ago, he wrote a book about his trip to China, which is aptly titled “Lost on Planet China.” As one may assume, Troost weaves a sidesplitting tale of his bumbles around China, making all sorts of cultural errors, eating live squid, accidentally finding himself in a brothel and a gay bar in the same week, and barely making it out alive. In short, China utterly bewildered – nay, bamboozled – him. 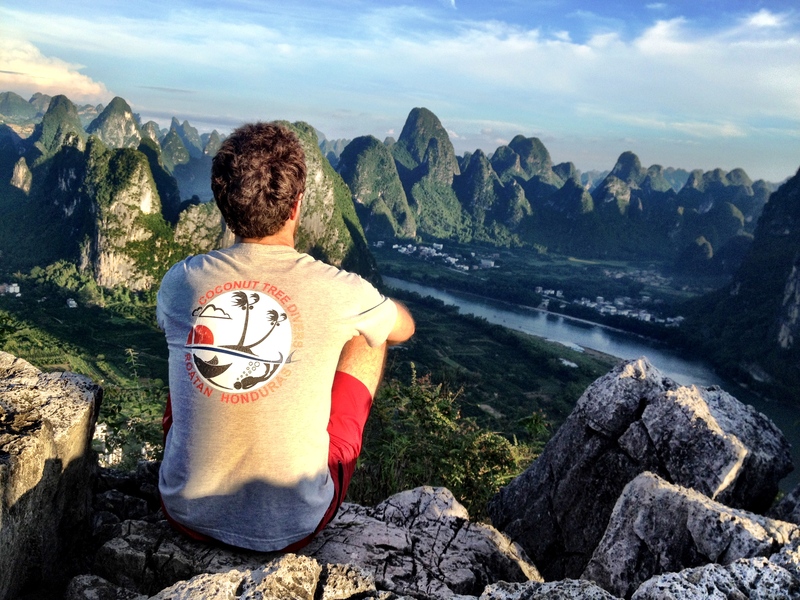 Like Troost, I was also a bit perplexed by China, though I experienced far fewer mishaps – which is a good thing, not because I renounce adventure, but because I wouldn’t be able to twist the mishaps into Troost-like comedy. But, I am very glad I went. While it would be incredibly foolish of me to say that the quick trip to China deciphered all the intricate riddles of the world’s most populous country, I do believe I have a much better feel for the place. Here are the basics: I flew from San Francisco to Hong Kong with 15 teenagers who would be embarking on amazing adventures of their own with Rustic Pathways. Once I connected them with their in-country program leader, I ran out of the airport and into the humid arms of Hong Kong, who took me on a dreamlike, head-spinning tour. I mostly just walked around with my head tilted all the way back and my mouth gaping open in awe. It is a very… vertical city. After meeting with Roger and stumbling around Hong Kong for a few more days, I flew to Shanghai to meet Phil, who took me to Cixi City, about three hours north of Shanghai. There, I toured two garment factories and fell in love with Phil. 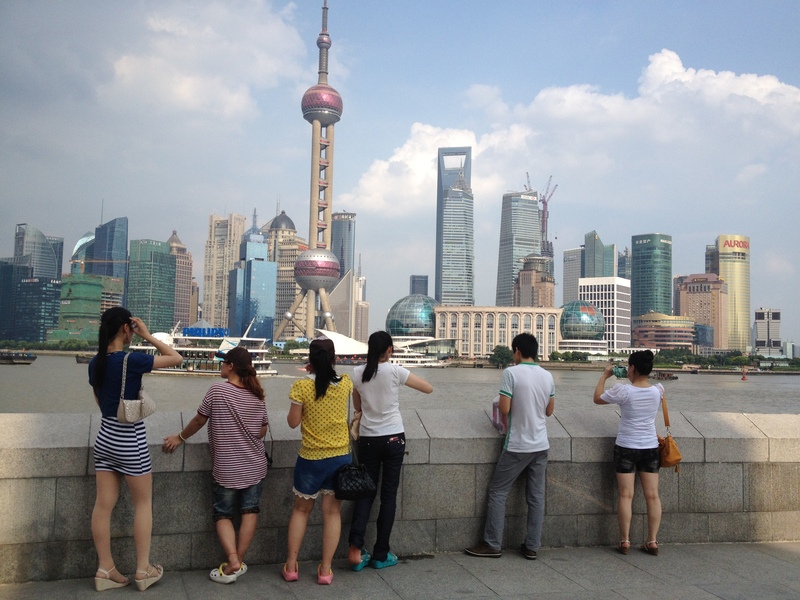 I then took the bus back to Shanghai where I had only enough time to take pictures of tall buildings and walk on the Bund before taking the zippy maglev train to the airport. 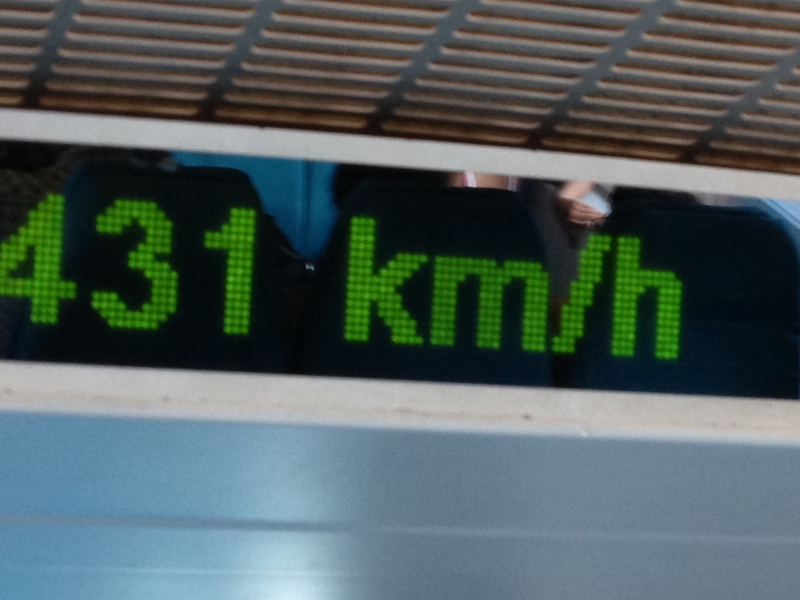 And when I say zippy, I mean it is one of the world’s fastest trains and topped out at 431 km/h on my journey. I have no idea how fast that is in real measurement, but it felt quite expeditious. After peeling myself out of my seat, I boarded a plane that seemed to only travel half the speed I had just accustomed myself to. I landed in Guilin (finally! ), where I spent a week exploring its environs, taking in some of the most picturesque scenery I have ever witnessed. I also hung out with young people in hip hostels. Which means I was forced to drink flaming Sambuca on the fourth of July. U!S!A! U!S!A! Then I flew back to Hong Kong, picked up 15 teenagers, and then flew home. It was indeed a whirlwind trip, and I am still recovering, but amazing blog posts are headed your way very soon! Take off a shoe. Check the tag. Remove your coat. Check the tag. Grab the nearest knickknack, flip it over, and check where it was made. Do a lap around the house. How much of your stuff was made in China? If WalMart’s inventory is any reflection on the average American household, about 70% of your stuff may have been made in China. That’s a lot. Until I started my year without Chinese goods, much of my stuff came from China. And in a sense, I didn’t have any connection to it… to the production of it. I had never been to China. I don’t think I had ever been to a factory. The grand process of fueling American consumption must be quite a task and I simply cannot wait to see it first hand. One of the overarching questions I hope to answer during my upcoming (I leave today) trip to China is just how all of our stuff is made. Where are all the factories? What are they like? Where do all the workers come from and what are they like? Are they proud that they have made so much of my stuff? The second question I would like to answer is why. Why does China of all places make so much of our stuff? The answer to this question lies in geography and history. Being a history teacher and overall nerd, one of the first things that I did when I found out I would be going to China was head to a bookstore. The three things I picked up were a Lonely Planet guide to China (printed in Singapore) so that I know where I am going, an etiquette guide to China (also printed in Singapore) so that I don’t offend every Chinese person I meet, and a 6-hour documentary on the last 100 years of Chinese history (couldn’t find a country of origin). It was in the last of these three that I think I found the answer. Around the turn of the last century, China was a vast collection of peasants governed loosely by warlords, who, as warlords are apt to do, were oft warring. This chaos kept China in a continually weak state, vulnerable to outside forces. Soon, the British, Americans, French and Japanese began to carve out colonies, or “areas of economic interest,” in China. 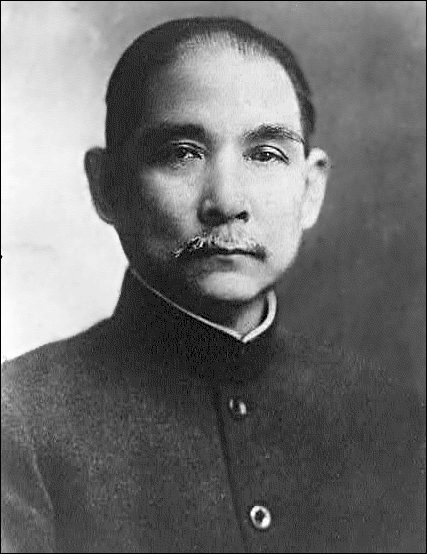 Embarrassed by the sorry state of his country, a guy called Sun Yat-sen (pictured) decided that China would only be great if it was independent and united. So he started the Chinese Nationalist movement and fought the warlords to unite China. He achieved this, to a certain degree, around 1911. Sun Yat-sen died in 1925 and his second in command, Chiang Kai-shek, took over where he left off. Around the same time, a guy called Mao Zedong decided that China would only be great if it was independent, united and communist. For a long time, Mao and Chiang fought each other for China’s ideological soul. The Nationalists won most of the battles, but could not fully extinguish communism. When the Japanese invaded China in earnest, the Nationalists and the Communists united to hold them off. They, frankly, did not do a great job of it. The Japanese only withdrew after their defeat in WWII. With WWII over, the Nationalists and the Communists got back to fighting each other. But because the people had had such a tough time under the Nationalists (and the Japanese) for the last four decades, they backed the Communists during the civil war. Mao and the Communists emerged victorious, while Chiang Kai-shek and the Nationalist government fled to Taiwan. Mao soon began a number of economic and social reforms. Mao wanted China to be a major industrial power, so he began huge public projects in the cities, building factories and a modern infrastructure. As China didn’t have very much money or foreign investment (Nixon didn’t arrive until 1972), Mao relied on the peasants to foot the bill. He forcefully put the peasants into agricultural collectives with the aim of growing lots of food to feed the cities and sell abroad. Due to laughably poor management and pervasive corruption, the collectives failed and caused the largest famine in history. Around 30 million peasants died of starvation. Mao didn’t do much better in the cultural realm either. His Cultural Revolution, aimed at getting rid of China’s ancient cultural practices in favor of a new Communist ideal, mostly led to French Revolution style madness and slaughter. China began to eat itself. 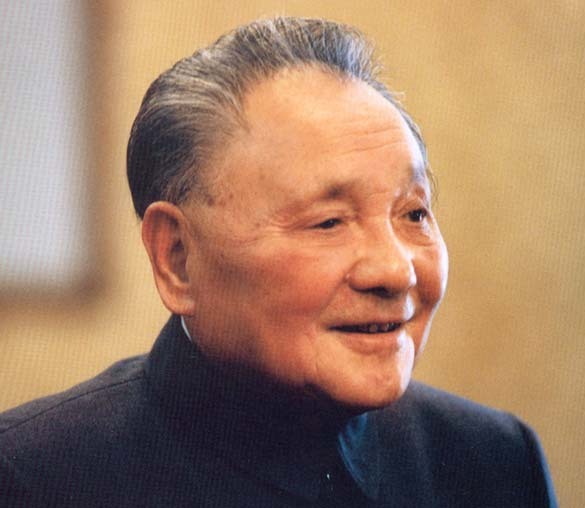 Things didn’t improve until Mao died in 1976 and his second successor, Deng Xiaoping (pictured) came into power. Deng realized that China would have to adopt some capitalist policies in order to be competitive. He disbanded the forced agricultural collectives in favor of an incentive based “household-responsibility program” where families were given a plot of land and were able keep whatever surplus they could muster after the government had taken a stated quota. This led to bumper crops that fed the countryside and the cities. It also saw the peasants earn more money than ever before, which increased the demand for luxuries. Deng also designated 18 coastal cities as special economic zones where capitalist practices were tolerated. As you could imagine, this led to an influx of peasants desperate for work and foreign investors desperate for cheap labor, in the coastal cities. This is where China wins. China is a vast area with a favorable climate, lots of natural resources and arable land. Geographically, it can support its huge population. With so many historically poor people competing for a finite number of jobs, labor will always be very cheap. Nike and Apple know this well. Deng Xiaoping continued with capitalist reforms, but stopped short of democratic reforms. He brutally put down the student demonstrations at Tiananmen Square. China remains an authoritarian state with many state controlled companies. However, its prosperity will not slow down demands by an emerging middle class for more social and political rights. This, of course, is not the whole story. 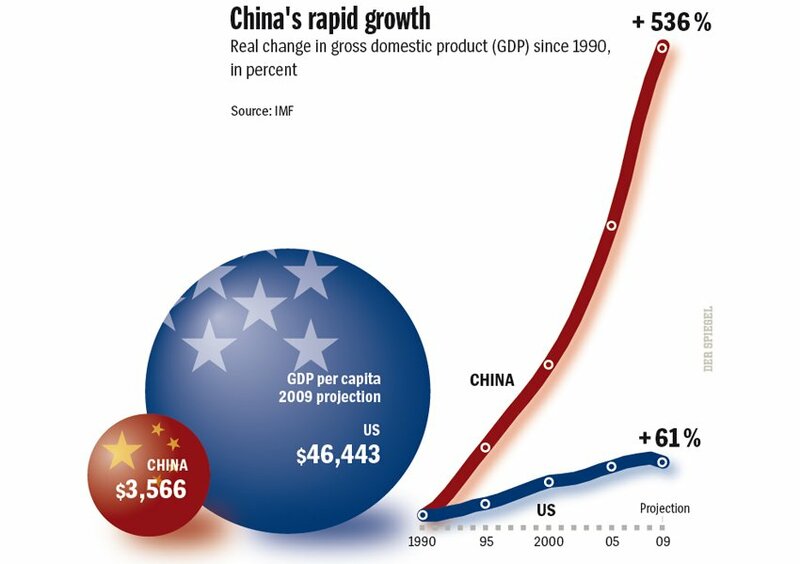 But it does offer some insight into China’s magnificent economic rise, which I am about to witness personally. Wish me well! I’m going to China. No, seriously. I am going in five days. Dear faithful readers, the Made in China Project is back! In reality, it never went anywhere. I have not crumbled under the pressure of not buying Chinese-made goods! I have stuck to my New Year’s Resolution and am still living Chinese goods free (mostly, my few accidental transgressions will be chronicled soon). My last post back in March announced that the Great Purge was near. The Great Purge did not happen. But life did happen. In early March, my girlfriend and I split up. As you could imagine, this took its emotional toll. The last thing I wanted to do was go through my apartment and tear it to shreds. Good news though, she and I are still friends, and she is still a fan of the Made in China Project! I apologize for the absence, but I am back… back in a big way. I have very exciting news. I am going to China! No seriously. I am going to China in five days. Here’s the deal. There is a company called Rustic Pathways that takes high school kids and dumps them in “rustic” locales around the world for the summer. Apparently traveling to amazing foreign places is supposed to wildly affect your outlook on life. Whatever. Anyway, I applied for a job with them back around Christmas time. They called me a few weeks ago and asked me if I would be interested in taking a group of kids to China. I asked them if they had read my blog, because the timing and location of their job offer was just too damn perfect. They hadn’t. Whatever. 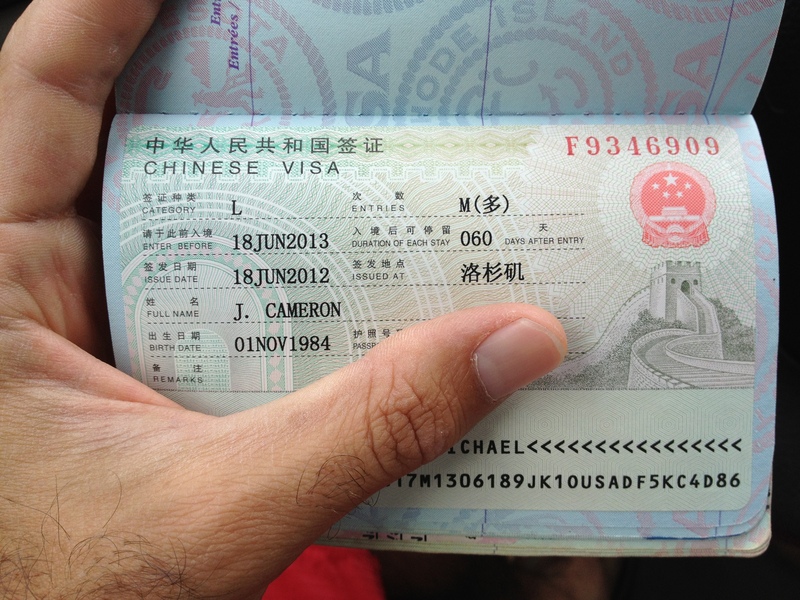 So I am going to China. Just applied for my visa a few days ago. Here is the icing on the cake, the fortune in the cookie: I was hired as a Flight Leader. I am only responsible to get the kids back and forth from San Francisco to Hong Kong. The kids join up with Program Leaders in country. They are the ones that do all the heavy lifting of looking after kids. Me? I’m free for 10 days until I have to take them back home. What shall I do with all the free time? Since getting the invite, I have done a bit of networking and favor asking. I found a few people who live in China who are willing to take me to some factories and give me a tour! So far, I have a footwear tour in Hong Kong set up (with a big company that you have definitely heard of), as well as two tours at textile and apparel factories in Shanghai. I am stoked out of my mind, but reader, be warned. I cannot promise anything. I can promise that I will take some pretty pictures of me gallivanting around China. I can’t promise that the factory tours will happen, or if I will be able to take pictures. This is China, they are an authoritarian state. I will be trying my best; I want to bring you the goods. But we will have to see what happens. Full Disclosure: I can’t disclose who has helped me get the tours because I don’t want to annoy their employers. Sorry. Also, Rustic Pathways is not endorsing me in any way. Faithful readers , this week is the week. The moment in my New Year’s Resolution where I get rid of all of my current Chinese-made goods: THE GREAT PURGE. Get ready for some cupboard-clearing-drawer-dumping-Goodwill-giving action. I guarantee you will be entertained… and horrified. Will I be left with a full wardrobe (at least we know I will at least have some shoes to wear)? Will I have any dishes left to eat on? Will I even be left with anything to clean with after the Great Purge dirties my house? Full Disclosure: I am not cheating by using Taiwanese goods. I believe in the One China Policy. Let me explain. 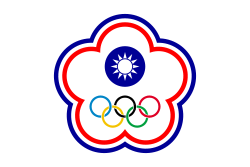 Essentially, both the People’s Republic of China (the big, communist China) and the Republic of China (the small, capitalist China on the island of Taiwan) claim to be the legitimate government of ALL China, even though neither political entity controls the entirety of the geographical China that they claim. Any country that does business with either China must recognize one as true, legitimate China. This makes it a little confusing to do business or compete in the Olympics. The US, and most of the rest of the world, recognizes the government in Beijing as the legitimate government of China, and thus calls the Republic of China, Taiwan. That is why your goods will either say made in China or made in Taiwan. I, like the US, recognize the People’s Republic of China as the legitimate China, and am thus allowed to buy goods from Taiwan. 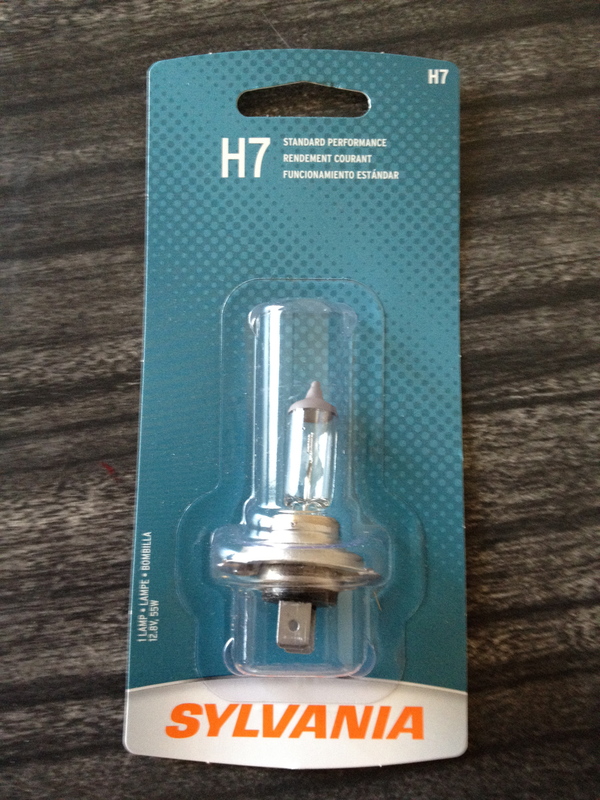 You may recall that a few weeks ago I was perplexed to find that a replacement light bulb for my headlight was marked “Made in Germany or China.” This ambiguous labeling inspired me to seek out the history and legal parameters of country of origin marking. After a long search, I found that the laws were fairly lax. They were right, the country of origin was clearly marked on the bottom of the bulb… just my luck, this bulb was made in China. So again, I have broken my New Year’s Resolution. But is it really my fault? I suppose it was a bit of a risky bet on my part, but I can’t deny I feel sort of swindled. This can’t be a legal practice can it? Presenting two countries of origin to the customer, one who is synonymous with quality and efficiency, and the other with crap? This can’t be right. This time, I have decided to actually contact the gubment to see if Sylvania’s practice is legal. I checked the Customs and Border Patrol contacts page to find an email address, but they don’t seem to have one. I will have to call them. If they answer their calls like they help people at the DMV, I should have an update for you guys by Sunday. Wish me luck. While you wait, here is a cute story. I hit the slopes last week. The first night in the lodge, I noticed a handsome sweater near the fireplace. Who could have forgotten such a beautiful garment? I checked on the sweater every night. It remained there, lost and unloved, for the entire week. As I left, I decided that I would adopt the sweater and take it home with me. Stealing? No! Salvage. Glancing at the tag, I was thrilled to find that it was just my size. Glancing a little harder, I realized that this sweater and I were not meant to be after all. But I did not let it remained orphaned! I gifted it to my brother who gave it a fine home. After concluding a previous post about replacing my horde of Chinese-made socks, a reader (thanks Brian) wisely recommended that I investigate the origins of my socks’ companions: my shoes. 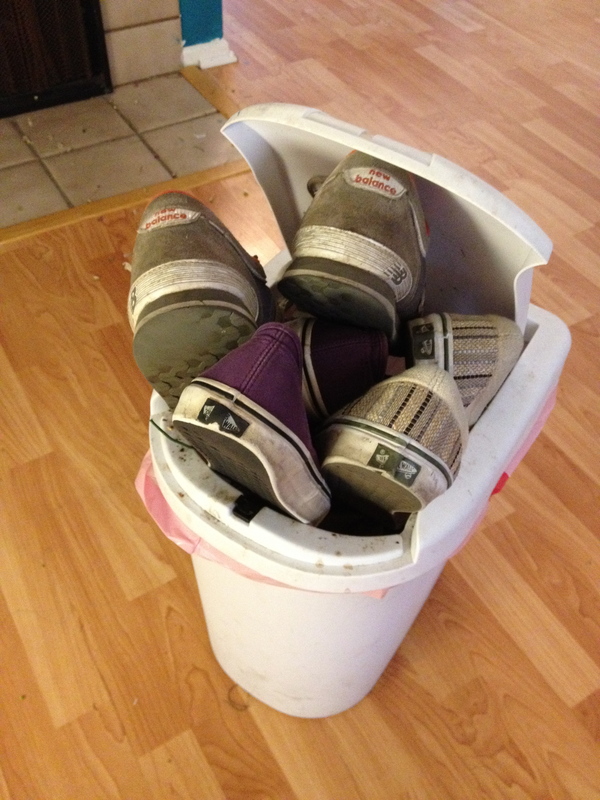 Over the course of the last month, I have been prepping for the “Great Purge” to make sure that I am not left naked, or at least, not barefoot, afterward. Well, it is a good thing I checked my shoes. Let me put it simply: If the Great Purge was to happen tomorrow, I would be left with one pair of leather boat shoes and some soccer cleats (all I would need in my perfect seafaring, soccer-playing world). Prepare yourself for an itemized shoe breakdown… I own, well owned, eight pairs of shoes: two pairs of leather work shoes, three pairs of casual shoes, and three pairs of athletic shoes. All but the two pairs previously mentioned were made in China. And unfortunately, the boat shoes were in disrepair. Essentially, I had to replace them all. My girlfriend and I hit up Santa Monica’s 3rd Street Promenade. We went to Steve Madden first, as that is where I purchased my old dress shoes. After about a minute of checking labels, I knew that I wouldn’t have much luck here. (My girlfriend, who isn’t boycotting China, bought some smart black pumps.) About 90% of Steve Maddens are made in China. The rest came from India or Mexico. Aldo was largely the same, with a few shoes originating in Romania or the Dominican Republic. Skunked at both stores, I headed to Nordstrom. 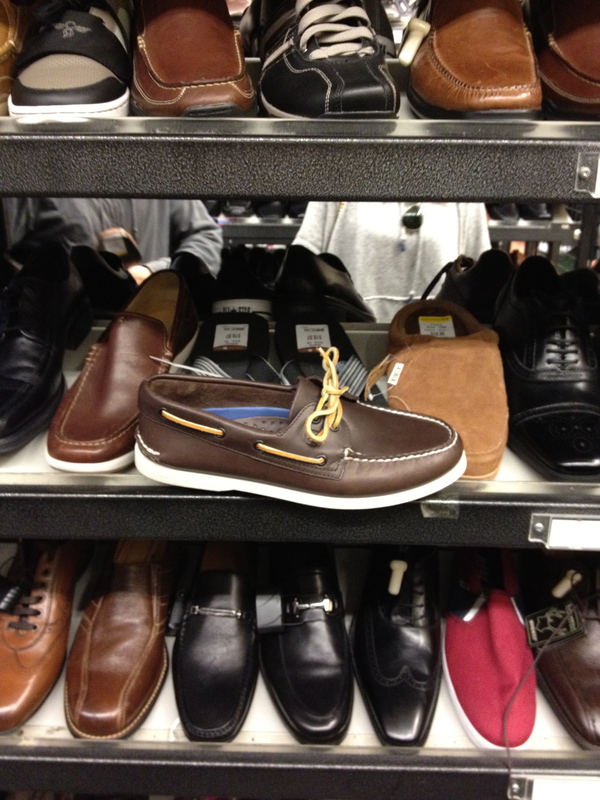 While Nordstrom still had a number of Chinese-made shoes, I found some brown boat shoes that were made in Indonesia and some classic black dress shoes that were made in the, wait for it… USA! With my work shoes settled, I now needed to find a pair of casual shoes and a pair of trainers. My previous casuals were Vans, and I was determined to make my future casuals Vans. Is there a more relaxed pair of kicks than Vans? No. No there is not. Unfortunately, both of my old pairs of Vans were made in China, which made me very nervous. After looking at about 400 tags, I learned a very interesting thing. Common shoes like Vans, Converse, and Nike are about 95% made in China. But, if you are persistent, you will find a few shoes from each brand that are made elsewhere. I have no idea why, that’s just the way it is. At the end of the day, I walked away with a pair of Vans Authentics and a pair of Nike trainers that were both made in Vietnam. The most important thing I learned from my shopping expedition was that about 90% of the shoes we commonly wear here in the United States are made in China. But unfortunately, I am now left with more questions: Why are so many shoes made in China? 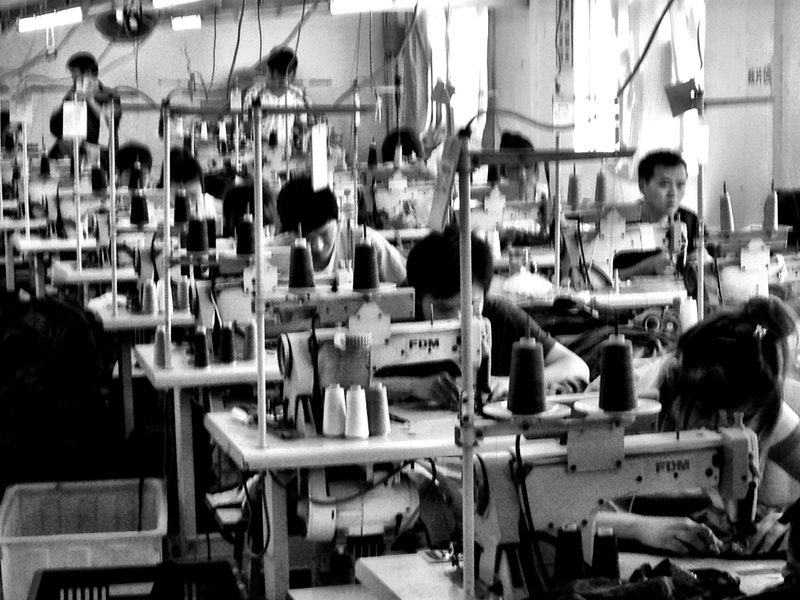 Why aren’t more shoes made in Vietnam, Indonesia, India, or the Dominican Republic? Can’t we spread the manufacturing love? Full Disclosure: I do not own a pair of TOMS shoes. I do like the idea of buy-one-give-one products though. I wear Warby Parker glasses, which gives one pair of glasses for each one that you buy. These, unfortunately, are also made in China. But because these are prescription glasses, and will take some time to order, I will have to replace them after the Great Purge. As you all know, my New Year’s resolution is to attempt the seemingly impossible: live without Chinese-made goods for one year. The task involves not only boycotting things made in China, but also cleansing my belongings of all Chinese-made possessions (save for Apple products, because honestly, who can live without them?). I have received a few comments from folks who want to know a bit more about the “Great Purge” as I have come to call it. To appease my readers, I am writing this post to clear up any confusion about what the fateful cleanse will entail. I have decided that the Great Purge will happen over the course of March. Soon enough that it will keep true to my resolution (and keep you entertained), but far enough away to allow for significant preparation—you know, buy the essentials before I trash everything. You may be asking, “Well, why the preparation?” The long and short of it being to prevent the sudden realization that I am out of clothing, or in need of bed linens, or a toothbrush, to name only a few. Why not rid yourself of everything at once? Why not do it in one post? Mostly, this is because of the large amount of work it requires and the little time I have to do it on the weekends (when I do much of my writing and researching). In addition, my job requires long hours of grading and lesson planning that spills over into, and greatly occupies, the weekend. But, I am also planning to do this over four or five posts in order to focus on one room, or area of my life, every week. This strategy will allow for a more in depth study of what I need to get rid of, and, consequently, what I will have to re-buy or live without. I will get rid of all of the made in China items in my apartment that are mine. I will not discard my roommate’s belongings that are in the common areas, because, well, I am assuming he would be pretty unhappy if he walked in the front room one day to place himself on the couch, only to find it missing (just checked: made in China). I will not get rid of the large appliances that came with the apartment. Luckily, I won’t have to (just checked: all appliances are by Frigidaire, which are “designed, assembled, and engineered in the U.S.A.”). I will not discard any of my work material that the school requires me to have. This is because I want to keep my job (just checked, my coach’s hat: made in China). I will not get rid of any of Apple products. I am not sure I really need to explain why. I will not toss anything that is of significant sentimental value. The only thing that I can think of off the top of my head is my first mandolin. It was $50 from musicicansfriend.com, and was, of course, made in China. I will not get rid of any gifts whose getting-rid-of will offend the gift-giver. Why? Because relationships are worth so much more than stuff. OK, that just about wraps up the “Great Purge,” now on to a funny story. The other day, the light bulb in my closet burned out. No big deal. I went to the cupboard and pulled out a replacement bulb, which was prominently marked with its country of origin. I’ll let you guess… China. Dang! 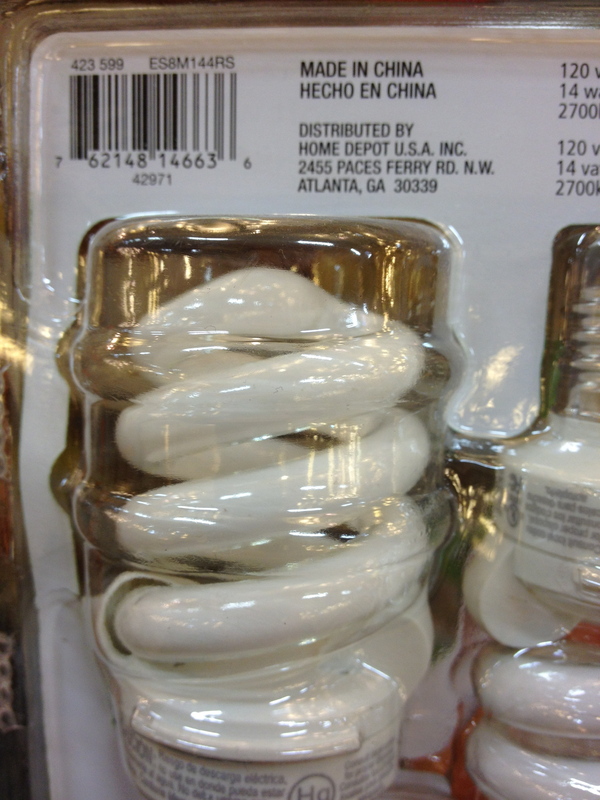 I had to dress in the dark for a few days until I went to the store and found a bulb that was made in the USA. I only buttoned my shirt incorrectly once. A few weeks ago, one of my car’s headlights went out. 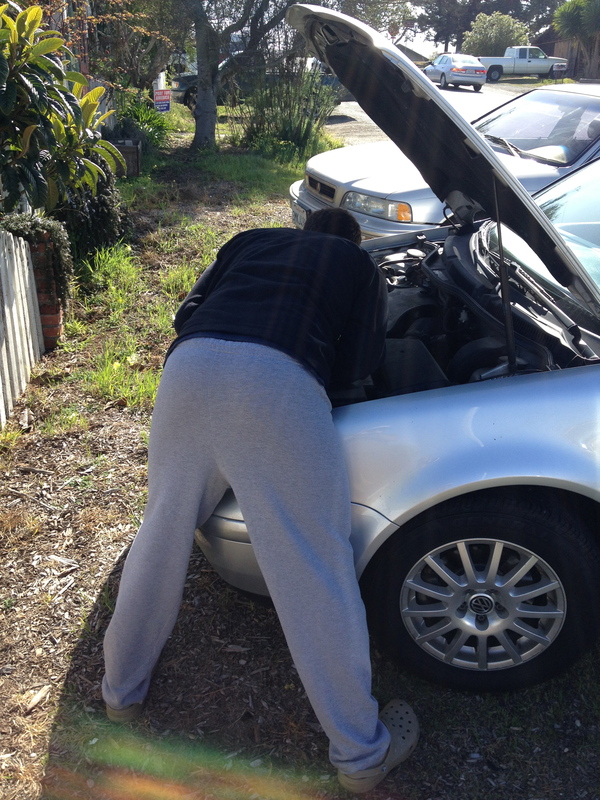 Rather than the typical reaction saved for automobile malfunctions, I was touched by excitement. 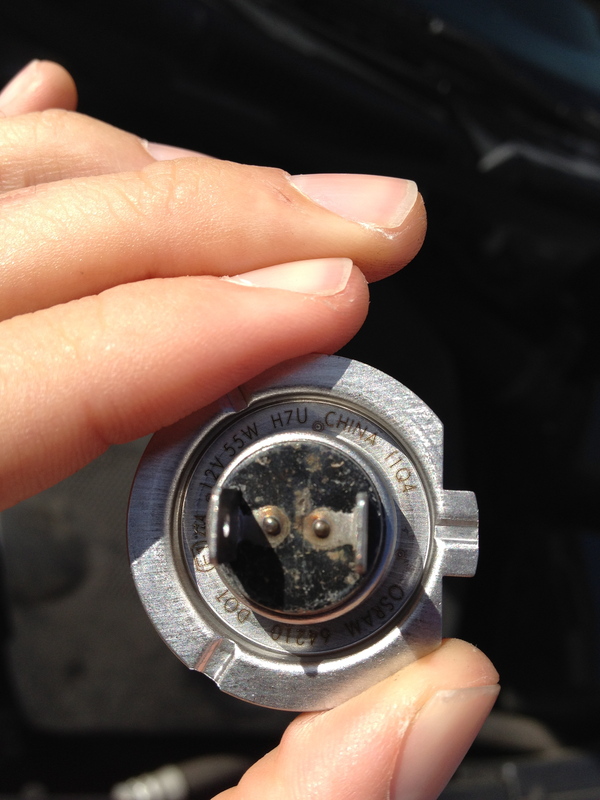 While staring at the one-eyed buggy that was my car, I remembered this blog! I would now be able to track down the origin of car light bulbs! This is probably the only time in my life when I will be happy that I need to replace anything on my car. AutoZone is the only place I shop for car parts. Besides being fairly common in California, their employees have always been helpful, making it easy to “Get in the Zone.” Anyway, I waltzed on up to the counter and asked for a light bulb. Watching the computer as the attendant typed away, I could see that I would have a fairly wide selection of light bulbs, which is great news for a guy that can’t buy anything made in China. Per my request, the AutoZone guy brought out the cheapest bulb. Immediately, I flipped to the back and searched for where it was made. 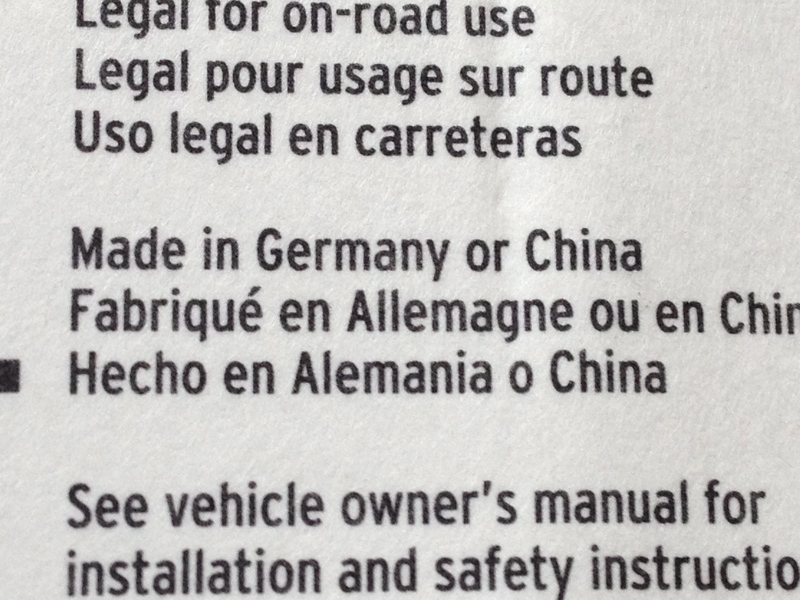 The package read: “Made in Germany or China.” Made in Germany OR China, eh? Well, which one? I could have easily asked for another bulb, but this perplexed and intrigued me. Up to that point, I had always assumed that every product would indicate exactly where it was made, and again, I assumed that there was some law dictating that. But “Made in Germany or China” had a particular non-exactness about it. I decided to investigate. The Act also required imports to be marked with the country of origin whenever possible, assumedly to discourage people from buying foreign-made products. Section 1304 of the Act delineates the basic rules of marking country of origin: it must be plainly stated, in English, in a conspicuous place on the item or its packaging. But can two different countries be listed? What about “Designed by Apple in California, Assembled in China?” The authors seem to have foreseen possible complications with wording. To this end, section 1304 also dictates that the Secretary of the Treasury (who oversees the collection of duties on imports) has the power to “determine the character of words… which shall be acceptable as indicating the country of origin.” Essentially, Representatives Smoot and Hawley did not define specific wording, but left that open for future modification. Which was a really good idea. We are living in a highly globalized world. That is to say, the products and services we consume come from all corners of the globe. Let’s say I buy a computer. That computer may have been “Designed by Apple in California,” made out of components from Japan, from minerals mined in the Democratic Republic of the Congo, that were finally assembled in China. And when I have problems with my computer, I call a guy in India for tech support. So, where was this computer made? Good question! A lot of places, I suppose. Let’s get back to today’s question: What are the current rules for indicating the country of origin in our highly globalized world? To find the answer, I headed over to the US Customs and Border Protection (henceforth CBP) website and looked up the rules for marking the country of origin on US imports (link is a download). Cognizant of the fact that many of the products that we consume are made in a multitude of countries, the CBP’s rules are fairly loose. For example, if a product goes through different levels of production in different countries, the only country it must be marked with is the last country where the product went though “substantial transformation.” This is why most things we buy only have one country listed, though the components, and the raw materials those components are made of, are seldom listed. More importantly, the use of the words “assembled in” are totally fine, as well as the “from components of” phrase that usually follows. But neither are required. In fact, you don’t even have to include “made in” in most cases—one just needs to name the country! Because there is very little else prescribed by the CBP, producers are allowed considerable play with what they write. Dear faithful readers. I’ve already blown it. I bought something made in China. A few days ago, I noticed that my loofah was looking pretty old and sad. On a recent trip to the grocery store, I picked up a new one for $2.99. For some reason, I just didn’t check the label. 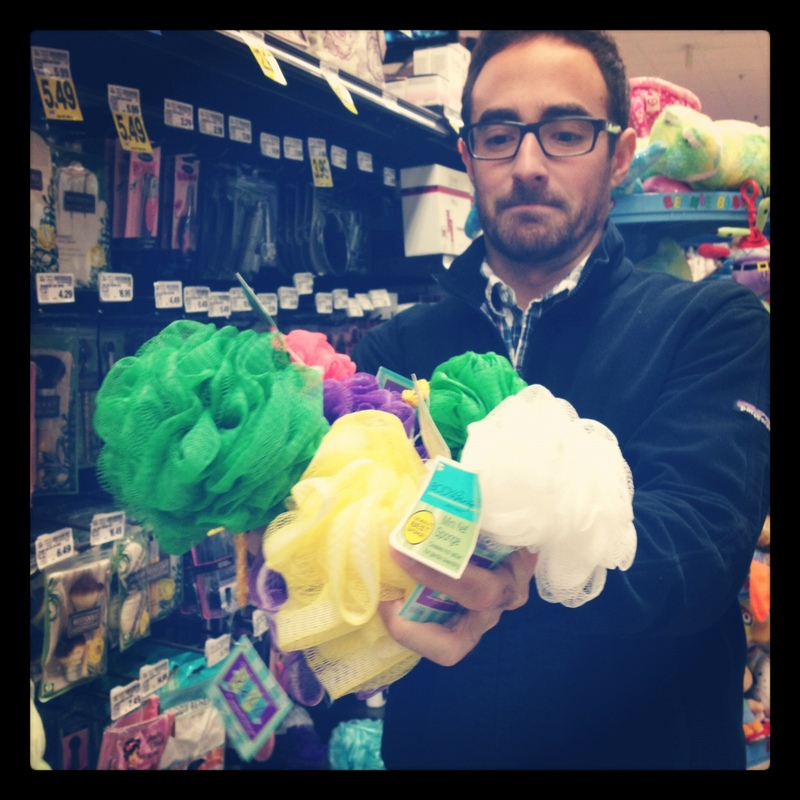 How hard could it be to make a loofah? Surely we don’t need to export their manufacture to China. Well, I was wrong. The loofah was made in China. My hands, defiled. My one goal, failed. After a short period of mourning, I resolved to make the situation right. 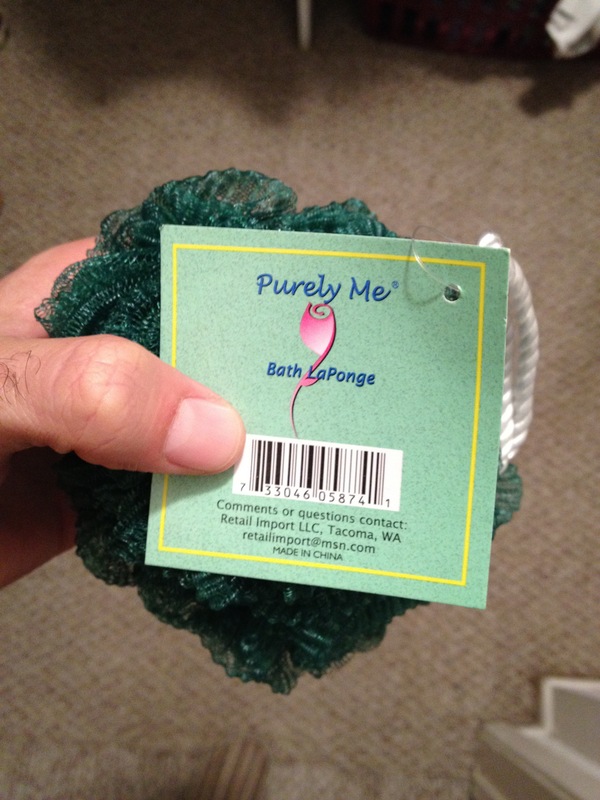 I gave the offending loofah to my roommate (as penance­—if I were to take it back, I wouldn’t financially suffer for my mistake) and went back to the store. There were lots of scrubbies to choose from. There were loofahs, scrub brushes, and even exfoliating gloves! My girlfriend (who came as moral support and to serve as guest photographer) and I looked at every tag. And they were all made in China. Literally, all of them. Even the Ecotool brush that claimed to be “soft and cruelty free” was made in China. We finally found a bath tool that wasn’t made in China. It was a sort of bumpy brown sponge that was made in Taiwan. I know the US government has a “One China” policy, but for the sake of my sanity, and the cleanliness of my skin, I don’t. While in the bathroom section, I checked out a few of the other toiletries I normally buy, just to be safe. Barbasol, Crest, Dove and Irish Spring (though the name suggests otherwise) are all made in the USA. Head and Shoulders is hecho en Mexico. I would have checked the Mach 3 blades, but they were behind a theft guard (but honestly, at $25 a pack, I would be happy to give those up). Full Disclosure: I consider myself absolved of all sins, and will be continuing the project. I will now be on full alert at the grocery store.